Warzone has just been updated to version 4.16.0! This blog post describes what’s changed. The website and Unity client have been updated to this version now. The Android and iOS apps do not need an update and will stay on 4.15. Have you ever been playing a multi-day game, only to find that the game mysteriously stops appearing on your My Games page? This is a common occurrence when your opponent surrenders but doesn’t give you a parting “gg” message in chat. Prior to this update, the My Games page would only show you active games or games with unread chat. This means that if a game ends without anyone chatting, the game would simply vanish from the list and never give the satisfaction of letting you see how the final turn played out unless you dug it out of the Past Games section. This was a very common complaint, and something that’s now finally fixed! For the first time in 9 years, the map designer is receiving an overhaul! The map designer is used, along with an svg editor, to make Warzone maps. Starting with this update, the new map designer is available to anyone whose account is in UJS mode by selecting Multi Player -> Design Maps. If you want to access the old map designer, you can still do so by changing your account into Flash mode. The biggest feature of the new map designer is that it does not rely on Flash. This means that maps will continue to be able to be created after Adobe kills off Flash in 2020. Yay! It also means it doesn’t require un-blocking Flash constantly and also loads much more quickly as a side benefit. As a bonus, the new map designer also has the ability to automatically default set the center of point of territories to the center of the object. While this won’t always be the correct center point, it saves a step when it is. The UI around creating and managing different versions of your map is also much clearer and faster to use. If you’re a map designer, please let me know what you think! Of course, the option to play Warzone in Flash still exists. Don’t worry, Flash users, that option isn’t going away yet. 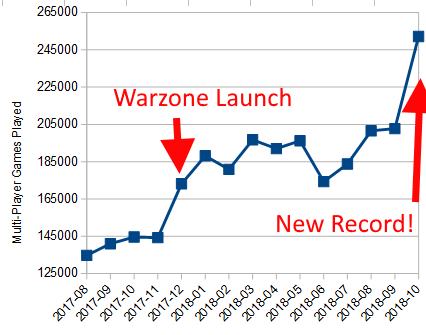 My numbers show that just over 1% of Warzone’s players are still using Flash. You will need to upgrade at some point, though, as Flash is being killed by Adobe in 2020. – iOS/Android: Push notifications are now sent when someone sends you private mail. – All: The chat room no longer advertises open game creation. – All: If no players in a quickmatch game enter orders on the first turn, they will all lose the game instead of randomly picking a winner. – All: When creating a double-elimination team tournament, third place will now always have coins that divide evenly by the number of players in a team. Thanks to Phakh Gokhn for reporting this. – Unity/UJS: When loading a template, you now have the option to load quickmatch templates. – Unity/UJS: Fixed the link color on players using Electric Purple so it’s readable. – Unity/UJS: Client-side mod failures now get recorded on the server so that the mod author can see them. – UJS: Fixed maps that use even-odd fill rule, such as Poland Big. Thanks to Dj Storm for reporting this. – UJS: Fixed an issue with local storage filling up. Thanks to Rome_Warrior for reporting this. – Unity: Blog posts are now only shown if they’re made within the last 7 days. – Unity: Decreased the number of posts shown per page on a forum thread to keep things loading speedily. – Unity: Mod authors now have an option to delete all pending reports at once, as a convenience instead of doing them individually. – Unity: Fixed a bug that made the map disappear when trying to open a map preview link that does not exist. Thanks to Bane for reporting this. Warzone has just been updated to version 4.14.0! This update brings the new Dark Theme to the game, fixes up the UI throughout many pages of the game, and fixes a few bugs and small improvements. This blog post describes what’s changed. As previewed previously, Warzone now has a fresh new look! In addition to the new theme, I’ve also gone through every page in the entire app and tested how it looks on small devices. The most difficult configuration to support is a 2.5-inch wide phone being held in portrait mode, due to the limited amount of horizontal space. I’m proud to announce that, with this update, all pages work well in this configuration. Prior to this update, some pages looked horrendously awful, such as the level up dialog and the community levels details page. I’m hoping this is a very appreciated change in the long run. Last week marks 11 years from when I first started making this game, way back in 2008. We’ve come a long ways since then, and we still have a long ways to go! – Unity/UJS: When making a tournament with a very short start time, the game now warns you that not many people will be have a chance to join. – All: Level “3 Blind Mice” made slightly easier. – All: Fixed InvalidOperationException error. – All: If a game with mods times out more than 10 times in a row, it will be automatically ended by vote-to-end. – Website: Fixed missing style on forum next to “hidden threads” link. – Unity: Fixed level up dialog from overlapping alerts. Thanks to Hamstirly for reporting this. – Unity: Fixed flag on full profile page. – Unity: Fixed a bug with changing accounts with the chat room open. Thanks to Beren for reporting this. – Android/iOS: Fixed the message that appears when a notification arrives while the app is open. Previously, it would always say the game “just advanced” even when it didn’t. – Android: Fixed a bug that made the hardware back button potentially break the tutorial. I’m working on a new theme for Warzone. Here’s a sneak peek at what it might look like. In all of these screenshots, the current theme is on the left, and the new dark theme of the same page is on the right. Warzone has just been updated to version 4.13.0! This update takes a first step towards the eventual goal at decreasing the amount of time it takes to complete real-time games. This blog post describes what’s changed. Starting with this update, the Warzone server now stores orders as you’re entering them in multi-player games. Previously, these orders would stay on the client until you pressed the Commit button, at which point all of your orders were sent to the server. Prior to this update, failing to press the Commit button before the timer hit 0 in an auto-boot game would result in you getting booted and losing the entire game. Now, with this update, Warzone will simply use the orders you’ve entered so far as your set of orders for the game and continue it as if you had pressed Commit. This makes the booter much more forgiving and allows you to continue to try and salvage a game where you would have otherwise been granted an instant-loss. Auto commit is a necessary prerequisite for games with faster boot times. Once this update is fully deployed, we’ll start to reduce boot times on some real-time templates to experiment with making real-time games faster. Prior to this update, you could only view orders entered by your teammate after they commit them. Now, you’ll be able to view your teammate orders as soon as they enter them. This greatly eases the collaboration in real-time team games. When your teammate deploys or attacks, the armies+arrows will show up immediately on your map so you can see what they’re doing. If they play a card, it will show as “Played” immediately so you know not to use it, alleviating the need to call out “I’m using the card” in chat. If you enter orders for a multi-player game on one device, you’ll be able to view or commit those orders on another device. Prior to this update, this was only possible if you were on the same device or if you committed your orders. When a multi-day game ends, players in it who have push notifications enabled will receive a notification letting them know whether they won or lost. Push notifications are also now sent leading up to the start of real-time tournaments you joined, giving you plenty of reminders so you’re ready for it. Your blacklist is now known as your block list. Its functionality has not changed, just the name. While the term blacklist has never meant to refer to skin color, we want to make sure that new players don’t think that it might. – Unity/UJS: Fixed the turn number displayed in the top left corner when watching turns. It displays one number lower than it did before. Thanks to the person who reported this on twitch. – Unity/UJS: Fixed a bug with mods that change territory ownership before deployments happen that would cause an error if someone deployed on a territory that they ended up not owning when the deploy order executed. – All: Sped up the animation speed slightly when watching turns play out. – All: Added a pop-up message the first time a new player opens Quickmatch that explains how it works. – All: Players below level 10 can no longer create private mail threads. – All: The surrender tutorial no longer requires watching an ad to play. Thanks to dannyB for reporting this. – All: Fixed an issue with FFA coin tournaments that caused the second place prize to be wasted if it didn’t divide evenly. It now gives the left over coins to first place. Thanks to Wayne for reporting this. – All: Fixed some issues to improve the reliability of 1v1, 2v2, and 3v3 ladder. – UJS: Fixed a bug that could cause alerts to close right after opening. Thanks to TBest for figuring out how to reproduce this. – Website: Separated Wiki and FAQ into separate items under the Help menu. – Website: Fixed a bug with surrender tutorial and Facebook login. Thanks to Syphen for reporting this. Warzone has just been updated to version 4.12.0! This update aims to reduce the number of boots that players experience during games. This blog post describes what’s changed. The web version of Warzone is updated right now. The Android app will be updated in the coming days, and the iOS app will be updated in the coming weeks. Warzone’s boot feature is essential. Back in the old days, before booting was implemented, a single player leaving a game would render that game stuck forever. Booting solves this as it ensures that the players who wish to continue the game can do so. However, in an ideal world, players would never get booted and would instead surrender. Some people don’t seem to understand the importance of surrendering and will simply walk away from games whenever they are losing. This manifests as players who show 40% or higher boot rates on their profile. These players are bad for Warzone in a few ways. In real-time games, it’s always annoying when you’re playing a game and your opponent doesn’t surrender, as it requires you to sit there waiting for the boot timer to expire before you can move on. Additionally, it’s a bad experience for the players who get booted as well, as they often find that their open games fill very slowly, or they have very few options available to them on the open games list due to prerequisites. I often get contacted by people who experience these troubles and have no idea that their boot behavior is what’s causing it. This update aims to address this problem. Here’s how! This helps educate players on what they stand to gain by improving their boot rate. The first time a player is booted (or every time if they have a high boot rate), they’ll be forced to endure a Surrender Tutorial. This is a new tutorial that walks them through how to press the surrender button in a game, and also educates them on why it’s better to surrender than get booted. It shows them how to surrender. New players sometimes simply don’t know how, as prior to this update there’s nothing at all in the app that even mentions the existence of the surrender button. Players were expected to find it by exploring the user interface, and some people never do that. It educates players on why they should surrender. Similar to the above Open Games change, it explains why it’s beneficial to have a low boot percentage. It’s a deterrent against rage-quitting. If players with a high boot rate know that every time they fail to surrender they’ll be forced to go through the tutorial again, they might think twice before walking away from games. At least, it’s taking up some of their time that they took away from their opponent. It develops muscle-memory of pressing surrender. Muscle-memory is a powerful tool, forcing humans to develop it can drastically affect human behavior. If you want to see what it’s like, use this link. Some people have been booted thousands of times, which is a hole that is impossible to dig themselves out of. Now that they’re being educated on why they should stop getting booted, they need a way to return to single-digit boot percentages that doesn’t take years. To accomplish that, all player’s boot percentages are now calculated based on their last 100 games instead of all games. This is a more accurate reflection on their likelihood to get booted from their next game. In time, all of these changes combined should have a drastic reduction on the boot rates of players. I hope to post a graph of the boots per game ratio in a few months, and I expect to see a drop in the numbers in the weeks ahead of this update. Stay tuned! – UJS: Alerts now use the UJS alert system instead of the browser’s. – All: Chat raffles are now sometimes a super raffle, awarding many more coins. – All: Fixed CannotAssignSlotsWithoutCustomScenario error caused by changing the map of a template that had a custom scenario defined. Thanks to TBest for reporting this. – All: Fixed CannotMixTeamsAndNonTeams error caused by templates that got saved with bad team data. Thanks to Braveheart for reporting this. – All: Fixed a bug that sometimes made chat room messages appear out of order. – All: Fixed a bug that sometimes made chat room messages get missed, particularly if they were sent very close together such as when rafflebot responded to a player. Warzone has just been updated to version 4.11.0! This update adds chat rooms, as well as fixes bugs. This blog post describes what’s changed. This update brings a whole new way of chatting to Warzone! Two types of chat rooms are supported: Clan chat, which lets you chat with your clanmates, and global chat, which lets you chat with the entire Warzone community. You can access the chat by selecting Community -> Chat on the website, or by clicking the chat button in the top right corner of the iOS/Android app (once it launches, see above). Not only does it allow chatting, it also shows activity going on in the community, such as forum posts, open games/tournaments, seasonal ladder activity, and more. Global chat provides an easy way to see what’s going on in the community at this very moment. The goal of this is to help bring the community together, especially new players who are just getting started learning Warzone. 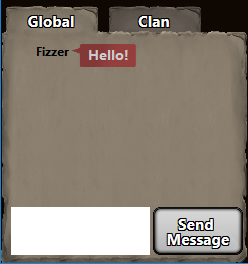 Clan chat makes it easy to talk to your clan members. If you’re in a clan and someone chats, you’ll see a small red number next to the chat room icon in the top right corner. Posts to your clan forum also show up here. I realize that many clans have already adopted a third-party chatting system, such as Discord. I’m totally fine with that, and if it works for you, I suggest you keep using it. Warzone’s chat rooms will never be able to compete on features with Discord. However, Warzone’s chat room will help supplement your Discord channel in a few ways. For one, you can use it to help get new clan members into the discord. Two, it shows all posts to your clan forum (and coming soon, it’ll also show players joining/leaving the clan as well as title changes). If someone in clan chat gets rowdy, clan managers have the ability to time them out. This deletes all their messages in the chat room and prevents them from chatting for a duration the clan manager specified. More features will be added to the chat rooms soon. Give it a shot and let me know what you think of it so far! – UJS: Fixed a bug that could cause an error when clicking on a button just as it was being removed. – UJS-Canvas: Fixed a bug when loading a map that was previously loaded from Flash that could give a “could not connect” error. – Unity: Fixed a bug that could cause an error when closing a game with mods at a specific time when it’s loading. Thanks to Gmanicus for reporting this. – Unity/UJS: Fixed the hover text of the coin icon at the top of a game that’s part of a coin tournament. It now shows the tournament’s prize instead of 0 prize. Thanks to Master Jaesar for reporting this. 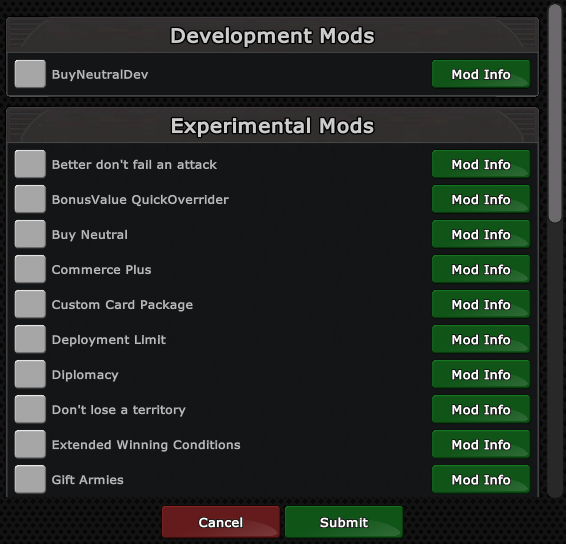 – Unity/UJS: Fixed a bug with mods sending a custom message to a game during the picking phase. Thanks to Krzystof for reporting this. – Unity/UJS: Fixed vote-to-boot text on yourself in games with banking boot times and vote-to-boot disabled. Thanks to number for reporting this. – Website: Fixed a bug that made some games not be exportable to YouTube. Thanks to Awesomezach04 for reporting this. – iOS/Android: Chat messages are now sent immediately when closing the software keyboard instead of requiring a second “send” press. – iOS/Android: Fixed a bug that could cause single player progress to be lost when signing up for a new account. – iOS/Android: Enabled autocorrect for software keyboards to aid in typing. – Android: Fixed a bug that caused the app to crash on some devices. – Unity: Added a link to the website’s profile from the unity profile page. – Unity: Fixed a bug with adding/removing friends that caused the changes to not be reflected until the app was restarted. 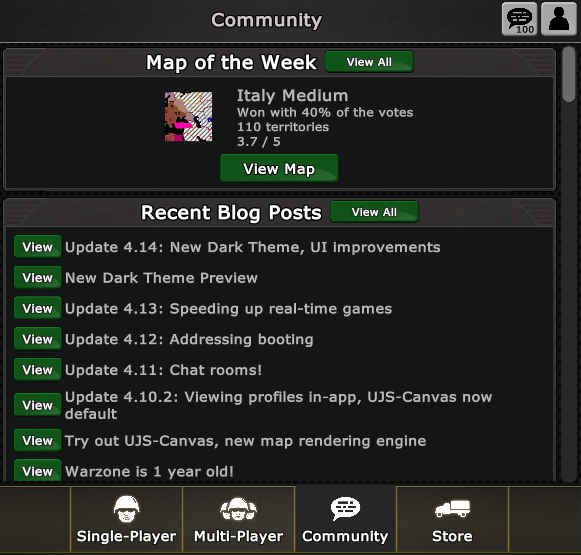 Author FizzerPosted on January 11, 2019 2 Comments on Update 4.11: Chat rooms! Warzone has just been updated to version 4.10.2! This update adds the ability to view profiles in the iOS/Android app, as well as fixes and improves a bunch of stuff. This blog post describes what’s changed. The update is live now on the website. The Android app update is available now — your device should auto-update in the coming days or you can go to the Play Store to update it manually. The iOS app update will go live once Apple approves it, which usually takes 2-7 days. The Unity client now has the ability to view player’s profiles directly in the app! It used to redirect you to your web browser app when selecting a “View Full Profile” button. This makes it much more convenient to view profiles. It also makes it much easier to add or remove other players from your friends list or blacklist, since those buttons are located on player’s profiles. The Unity client can now create private mail threads with other players! Previously, it was only possible to reply to mail threads that were sent to you. This is done via the new Send Mail button on a player’s full profile page. The UJS-Canvas mode, that was introduced as experimental in the previous update, is no longer experimental and is now the default mode for all players. The UJS-Canvas mode makes playing games on the website faster and look nicer. You can still switch back to UJS if you don’t like it for some reason, but please send me mail and let me know why you did so! I’m making a small tweak to the popular quickmatch template “MME Commanders LD No Cards”. West China will be worth 1 fewer army per turn, from 6 to 5. This will go live within the next day or two, so be on the lookout for that. – Unity: Added the ability to view player’s profiles right in the app. – Unity: Added the ability to send mail to other players. – Unity: Added the ability to add/remove players from the friends list or blacklist. – Unity: Long tournament names no longer get truncated on the tournament page. – Unity: Fixed a “failed to deserialize vision” error. – Unity/UJS: Tweaked the scale of the metal background image a bit. – Unity/UJS: No-split games now hide the “attack by percentage” check-box since it has no use. – Unity/UJS: The “Game Summary” button is now green. – Unity/UJS: The statistics search dialog now displays all items in its list by default instead of requiring a search term. It also paginates its results. – UJS: Tweaked image rendering mode to make them smoother. – UJS: Fixed “Kp is null” error. – UJS: Fixed “Failed to read responseText” error. – Website: UJS-Canvas is now the default web mode. – Website: The “Could not connect” dialog will no longer spawn more than one at a time. Thanks to Hades for reporting this. – Website: Updated About page. – All: Fixed a bug that made points in the last 30 days extend beyond 30 days. Thanks to aoc for reporting this. – All: Disabled trophy awarding for real-time ladder. 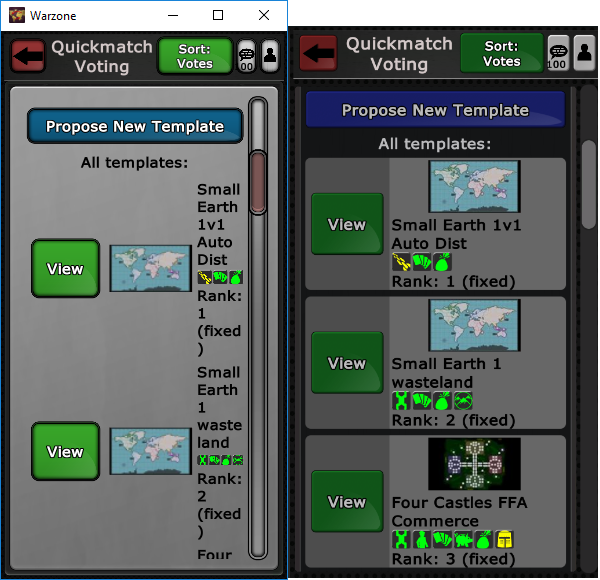 – The Quickmatch voting page now allows sorting by newest templates. – Fixed a bug that could make white territories overlap a map. Thanks to ViralGoat for being the most recent to report this. – Android: The app now clears all notifications from the notification tray when it’s open. – When inviting your friends to a tournament, it now separates them into pages. This keeps the page from getting too slow if you have lots of friends. Thanks to ViralGoat for reporting this. – The “View Tournament” button in full settings now directs to the tournament correctly instead of opening your browser. Thanks to alexclusive for reporting this. – Fixed a bug with the army cap that made your displayed income in the lower right corner show incorrectly after committing your turn. – Coin tournaments now show in the settings how many extra coins the creator provided towards the tournament prize. – Fixed a bug that allowed the quickmatch leaderboard category dialog be opened multiple times. Thanks to TBest for reporting this. – Fixed a bug when a mod called GetTurn() with a floating point number. Thanks to kevin#1 for reporting this. – Fixed a bug with viewing perspectives. – Fixed a bug with community levels that could cause an error when adding multiple special units to the same territory. – Fixed a bug with boss units on community levels that use high fog levels. Thanks to Rucka for reporting this. – Fixed typo in tournament chat. Thanks to Olja for reporting this. – Fixed a bug that could cause an error if a territory was clicked just as a game ended. Thanks to Drama for reporting this. – Fixed a bug that prevented joining coin tournaments if you had exactly the number of coins as the entry fee. Thanks to Pohorex for reporting this. – Fixed a bug that could cause “bubble doesn’t have a slot” error when loading a template that used custom scenarios then changing the players. Thanks to Johnson Dibbles for reporting this. – When double-tapping to attack with all armies, it will force attacks into attack/transfer mode. This fixes an issue where the second tap could hit the mode button switching it into Transfer Only on accident. Thanks to Pooh and Muli for reporting this. – The app has been renamed on the app stores to avoid use of the “Risk” trademark. App descriptions were also updated.